Storage Instruction: Store in a cool dry place. Once opened, consume within three days. 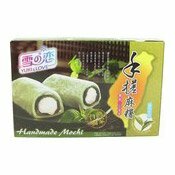 Ingredients: Maltose, Red Bean Paste (22%) (Red Bean (9.3%), Sugar, Maltose, Soybean Oil, Maltodextrin, Red Bean Flavouring (0.06%)), Glutinous Rice Powder, Sugar, Vegetable Oil (Palm Oil, Canola Oil, Coconut Oil In Varying Proportions), Potato Powder, Water, Fructose, Red Bean Flavouring (0.2%), Preservative (E202), Emulsifier (E471), Thickening Agent (E415). 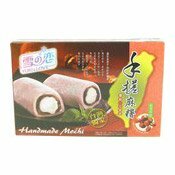 Simply enter your details below and we will send you an e-mail when “Handmade Mochi (Milk Red Bean Filling) (紅豆手搓麻糬)” is back in stock!